There will be a whole series of events about “Tinkerforge and IoT” in different cities of Germany and around the World in the coming months. 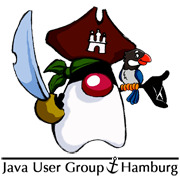 The first event will be on the 7th of July in Hamburg. The series of events is called LiveHacking and will be managed by Sven Ruppert. You can attend for free, a description can be found here (German). Sven works for the Codecentric AG and does lots of lectures at Java User Groups (JUGs) and he writes for Jaxenter and EclipseMagazin. Currently he is engaged in “Internet of Things”. While searching for appropriate hardware for his events he found the Tinkerforge building blocks, which he will use to familiarize people with Java8 in the context of IoT. Bastian (from Tinkerforge) will also be present at the event in Hamburg, which is unfortunately already booked out. More LiveHackings are however planned. In the past we only wrote about the hardware of the RED Brick. Today we want to discuss the software infrastructure of the RED Brick. Attention: This article discusses the technical details of the software of the RED Brick. This detailed background knowledge is not necessary to use the RED Brick in its final stage! The following graphical overview shows the currently planned software infrastructure. This infrastructure will be explained in this blog post. The stack, as well as Mini USB and USB A, are shown as the interface between the RED Brick and the environment in the graphic. The Mini USB connection is used to provide a composite USB gadget driver with two USB classes: The first class is a serial port. It can be used to get easy shell access to the RED Brick. The second class is the Brick API. A PC will see a RED Brick that is connected through USB the same way as any other Brick. The RED Brick has an API like other Bricks and Bricklets. With this API the RED Brick can be configured. The configuration consists of the transfer of the user program, configurations for the program execution (programm is started once, every hour, on startup, etc. ), as well as other configurations. Thus the RED Brick can be seen as a black box that controls Bricks and Bricklets with high level languages. Over the stack connectors it is possible to use all Bricks as well as the Ethernet Extension and RS485 Extension with the RED Brick. For the Ethernet Extension we have to write a driver. This driver will show the Ethernet Extension as a normal Ethernet interface in the linux system (eth0). With the USB A connector you can use any USB devices (mouse, keyboard, WIFI stick) and of course also other Tinkerforge hardware. All of these connections can be used at the same time. A RED Brick stack that is connected to a PC via Mini USB, uses Bricks and Bricklets, uses more Bricks and Bricklets through the RS485 Extension, is connected to the Internet through the Ethernet Extension and has other devices connected over USB A is possible without problems. The Linux distribution of the RED Brick is based on Debian. It is already making very good progress. 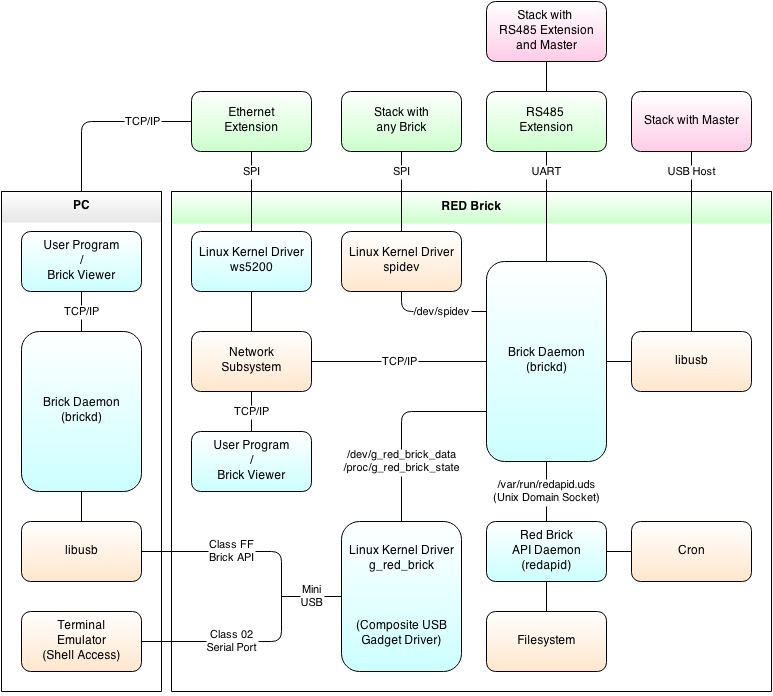 The Linux kernel configurations that are necessary for the components (RAM, power supply) and the interfaces (USB Mini/A, HDMI, SD card, SPI/I2C/UART in the stack, GPIO, LEDs, etc.) are done. All of the Tinkerforge Bindings and the necessary compilers and interpreters are preinstalled in the distribution. Additionally the most important libraries for all of the supported languages are preinstalled, this allows the development of more complex applications. Full image: This image makes all possible functions of the RED Brick available, including the graphics driver for OpenGL and graphical output via HDMI. Fast image: This image is designed for maximum speed. For example the GPU is turned off in this image, which reduces the boot time significantly. The communication between Bricks in the stack is done over SPI. The currently used protocol, which is used between Bricks, is made for the SAM3S4 processor that is used by the Bricks. This protocol is very efficient, but it would bring the Linux system on the RED Brick to its knees. The solution for this problem is to use DMA, the processor is not burdened by the communication if DMA is used. The protocol that is currently used is not compatible to DMA. Thus we have to design a new SPI protocol that is compatible to the DMA controller of the SAM3S4 processor as well as the A10S processor that is used on the RED Brick. This protocol then has to be implemented on the RED Brick as well as all of the other Bricks. The new protocol is completely laid out and the implementation for the SPI slaves is finished. Currently we are implementing the SPI master driver for the RED Brick. It looks like we will be able to use /dev/spidev, which simplifies the development since it can be done completely in the Brick Daemon. If we get performance problems we can easily transfer the relevant parts directly into the Linux kernel. The RED Brick API Daemon is a daemon that implements the API of the RED Brick. That means it implements the configuration that can be done over Mini USB. The most important components of the API are laid out and the necessary infrastructure (communication with Brick Daemon etc) is implemented. The composite USB gadget driver makes two interfaces available over Mini USB. Through this driver the RED Brick is seen as a “normal Brick” on the PC. It is however possible to get shell access to the Linux on the RED Brick at the same time. The driver is ready and functional. The goal is to be able to configure the RED Brick with the Brick Viewer. The API of the RED Brick only needs to be used by “power users”. The “normal user” can use the Brick Viewer to transfer his program to the RED Brick. The implementation of the user interface has not yet started. The Ethernet Extension uses the WIZnet W5200 IC for Ethernet communication. There is unfortunately currently no Linux kernel driver available for this IC. But there are drivers available for the very similar W5100 and W5300, which will simplify the implementation of the driver greatly. The implementation of the Ethernet driver has not yet started. Support for the RS485 Extension has currently a low priority. We will start with the implementation after the RED Brick is officially released. Last year the first German Maker Faire in Hanover took place. We were glad to meet some of our customers at the exhibition and had interesting conversation with you guys. Therefore we will be at the Maker Faire this year, too. Maker Faire takes place from 5th to 6th of July at Hanover Congress Centrum. This time with much more space. You can find more information about it at: http://makerfairehannover.com/. Of course we will have some RED Bricks with us ;) . We look forward to meet you! 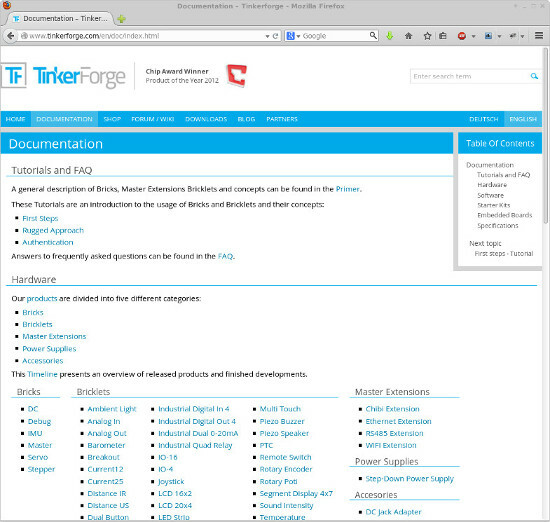 We have revised the Tinkerforge documentation. A newly created Primer should give an overview over Bricks, Bricklets, Master Extensions and the concepts behind the system of Tinkerforge building blocks. While doing this we also overhauled each product page. Most likely something has gone wrong somewhere during this process (broken links etc). Please contact us if you find dead or wrong links. Thanks! The Education Kit is intended to be used in education. We didn’t modify the kit for a long time. The number of Bricklets which can be used directly, without any custom external hardware, has grown. We revised the kit with this in mind. For example we have replaced the IO-16 Bricklet, where buttons and LEDs can be attached, by Bricklets such as the Motion Detector Bricklet or Multi Touch Bricklet. The new Kit permits a bigger number of projects that can be created only by sticking the modules together. The Tinker Kit is intended to provide the hardware for nearly any imaginable project. This kit also was not revised for a long time, such that the question came up which new modules should be put in the kit and which to remove. We have decided to put everything in the kit. In this kit each Tinkerforge module is now included at least once. Exactly the right kit for those who need a collection of parts and do not know what future projects will bring. Things are going well with the RED Brick. Next week we will give you more information about the current status.